While things in low sec are still pretty active, the war with Caldari Militia has been mostly, well, un-war-like. We've seem to have entered a "nightmare scenario" where one side has dominance in warzone control and the other side has no incentive or ability to break that control. Currently Gallente militia controls 79 systems while Caldari controls 22 and that situation has been mostly static for the recent past. What was always expected to occur was that if one side dominated that two pressure valves would activate to start the pendulum swinging back to the other side. The first was that the winning side would be burnt out or get bored beating up the losing side and would go off and do other things allowing the other side to regroup and push back. The second valve was that the winning side would flood the market with their loyalty point store purchases and devalue their loyalty points while at the same time the other side's LPs would gain in value as the supply of their store items became limited, thus encourage LP farmers to switch from one side to the other. However, those valves are not working. First off, because the warzone is so inhabited by PvPers, not only those in faction warfare but low sec "pirate" groups, that groups in a winning militia do not need to go on vacation for activity. Rather, they can simply change their objectives to spar with a different group or groups over non-faction warfare resources or just for "gud fites". Secondly, most veteran faction warfare pilots don't earn the majority of their ISK through loyalty points. Instead pilots have secondary income sources such as exploration, planetary interaction, trade/manufacturing alts, etc that are all more lucrative per hour than plexing for loyalty points. This leads to the effect that people don't plex very much even when winning so the supply does not spike and prices remain relatively static, thus very little incentive to LP farmers to switch en masse from one side to the other. Couple in all the changes to make LP farming more difficult to do in an mostly-AFK manner and the farming of LP dynamic is pretty much negated. As we discussed this in the fleet last night while the only CalMil fleet was a handful of assault ships that ran away very quickly, we threw around some ideas to try and break the deadlock. One thing suggested was increasing the rewards or uniqueness of items in the loyalty point store for the militias, which might encourage more offensive plexing and draw in more pilots to fight for control of systems. But really that only increases the number of for-profit farmers and not the actual bread-and-butter PvPers. Busier is not necessarily better. Another idea was to work on a Viceroyalty program where groups in faction warfare could gain more control of a system or constellation, encouraging groups to fight for the militia to secure a more personalized home. For example, claiming viceroyalty of a system could allow a group to charge docking fees or repair fees in stations in their system. By giving groups something to build up and claim, you give something for other groups to try and destroy. Right now kicking an opposing militia corp out of a system is an inconvenience at best. However, this is a radical change and would require a lot of design and thought before implementation. I know at one time CCP was thinking about making faction warfare a free for all instead of the current 2v2. This might invigorate the war by giving everyone more opponents, for example, current dominant militias Gallente and Minmatar could fight for overall dominance giving Caldari and Amarr a chance to rebuild. Or, it might not make a difference as the distances involved between the warzones might keep them isolated anyways. There does not seem to be any simple answers. Maybe there's room for a faction that's too powerful splitting. There was the GalMil civil war a few weeks back against Rapid Withdrawal. What if they could set up their own faction by breaking free of the rest of the militia somehow? I think it's somewhat important to note that the 'victory' of the Mininmatar was only archived via the exit of all but 30 or so of the Amarr militia to other areas, combined with the exit of the traditional pirate forces in the area as well. It rather stretches the definition of the word Victory, all in all. It cycles. Whilst I haven't been in FW for a bit, since 2009 there have been countless occasions FW stagnated. In these periods I've swapped WZ (corp joined up with the Matari), become a null bear (what a ****ing mistake that 4 months was) and gone full pirate. Eventually things pick up but will cycle back to stagnant. At fanfest 2015 CCP gave us some hope but the developer time never materialised. 2016 didn't even give us the "may be" we got the previous year. Nice article Kirith.... It's not really a galmil civil war just more targets. Rapid runs open fleets to militia, we might even blue for systems pushes. Can't see any benefit to Rapid Withdrawal dropping FW, it's great fun plus we have lot of friends in militia. 5k kills a month fun. I agree with I would like to see the 4-way fight, so we could see how that plays out. Phrased a different way, I don't see much downside to that. 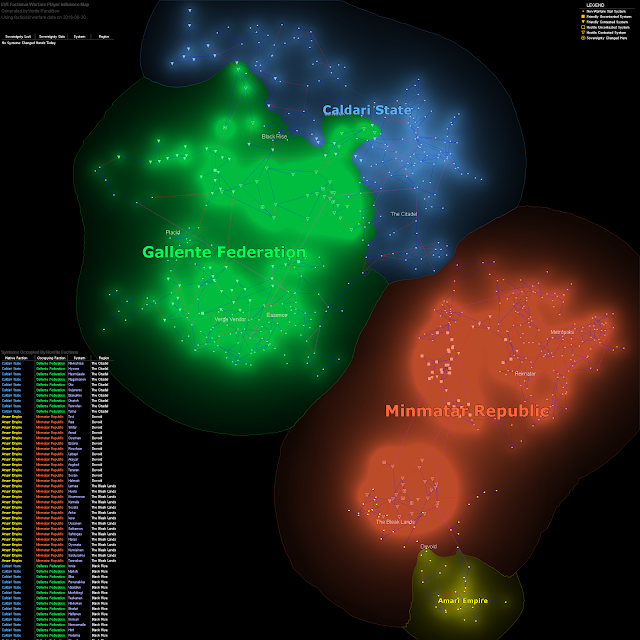 I think you have your facts wrong on this though: "Currently Gallente militia controls 79 systems while Caldari controls 22 and that situation has been mostly static for the recent past." If you look at Dotlan (or if you've been following things internally) you'll see that GalMil has rolled up 8 systems in the last 14 days. With the Caldari abandoning Hasmijaala (lost 15 days ago) the competition in the south is pretty gone. As you note, the PVP content is now in pirates (and for us in RDRAW, our cousins in BEBOP and GMVA). It is an interesting puzzle for CCP. In a sandbox game do you trust that the pendulum will swing back eventually, or make a change that could be seen as disadvantaging the current "winners." Certainly we see plenty of those recriminations amongst the tinfoil-adorned residents of nullsec.